FERGUSON, Mo. - A memorial tree for Michael Brown, the unarmed 18-year-old black man who was killed last summer by a white police officer in Ferguson, Mo., was found cut in half less than 24 hours after it was dedicated, reports CBS affiliate KMOV. 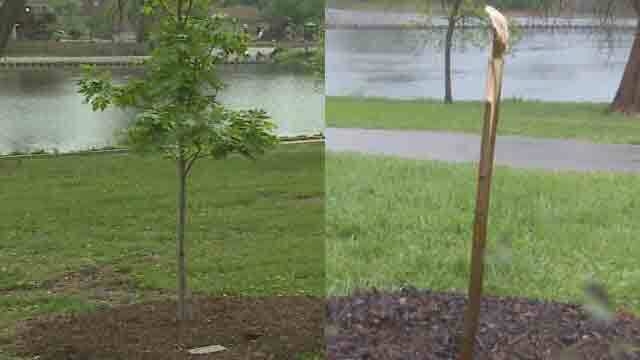 The tree was dedicated Saturday by the Black Caucus of the American Library Association as a "symbol of peace, comfort and hope," but was found vandalized just hours later, on Sunday morning. A stone that was placed at the memorial was also missing, according to the station. The memorial was located along a walking trail in January Wabash Park in Ferguson. KMOV reports police say they were investigating but do not have any suspects yet. A grand jury declined to indict Darren Wilson, the Ferguson police officer who shot and killed Brown on August 9, 2014. The case inflamed racial tensions and sparked sometimes violent protests across the county. It also prompted a review by the U.S. Justice Department, which decided not to prosecute Wilson, who resigned in November. The federal department did, however, release a scathing report blasting the city's police department for racial bias and profiling.